GrailQuest - Helping People Use Computers for Fun and Profit - Atlas Shirked - Let's Fire Him! In Ayn Rand's book, Atlas Shrugged, we are introduced to a world that is not sufficiently appreciative of the capitalists that rule it and who control access to the goods and services upon which civilized society depends. The ingrate proletariat mob begins to insist on a larger share of the wealth created on their backs, to which the courageous captains of industry respond by getting indignant and conspiring to jet off to a secret compound in the Rockies, leaving the ignorant masses to starve in the dark until they come to their senses and realize the true value of their overlords. Today, we see a similar dynamic playing out as billionaires buy our government outright and turn a blind eye to climate change, pollution, corporate fraud and theft, healthcare malfeasance by insurance companies, pharmaceutical companies and practitioners, and the military industrial complex bombing poor brown people already suffering from repressive regimes and living in a desert. They must believe that their money will be able to buy them clean air and drinkable water even though their means of making money poisons the world's supply of both. All the while climates suitable for growing food continue to shift and shrink. Or maybe they hope to buy a ticket on a spaceship to an as yet undiscovered world. Certainly, they'll at least need to buy more security as the conditions their greed creates cause billions to resort to desperate measures to feed their families. A normal person with an ounce of human empathy would not persist in this violent despoilment of Earth's resources carried out by the one percent. Even a wholly self-centered person would realize that the planet they are ruining is the only one they can possibly live on. It's like sawing through the branch you're sitting on. The people ruling the world must be sociopaths/psychopaths. An article on LiveScience.com stated, "Psychopaths make up about 1 percent of the general population and as much as 25 percent of male offenders in federal correctional settings, according to the researchers. Psychopaths are typically profoundly selfish and lack emotion." One percent you say? Hmmm. The US population is about 321 million, meaning we likely have 3.2 million psychopaths among us. If psychopaths make up 25 percent of incarcerated felons, I would venture a guess that they make up about 90 percent of elected senators, representatives, lobbyists, CEOs and other assorted men occupying the highest places in our country. It's no secret that the oval office is 100 percent occupied by such an emotionally lacking person. Look at the Hare Psychopathy Checklist and see how many boxes our dear leader checks off. I don't generally condone extreme speech, or violent behavior, but when our whole civilization is at risk, I think no measure too extreme to protect society from psychologically/emotionally defective predators. If a psychopath broke into a family home with the intent to do harm, the world would judge the householder justified in shooting him to protect his and his family's lives. We have a tremendous host of psychopathic greed monkeys pulling the levers of power in our government, and the number of lives at stake is no less than 7.5 BILLION! No, I'm not saying to kill them. That would be the same violent overreaction that is the source of so much destruction and suffering in the world now. I am saying we need to make a concerted, focused effort to VOTE THEM OUT, based on a verifiable set of values. Sadly, there is no political party affiliation that can be used as a predictor, or indicator of psychopathic behavior. Both parties take money in exchange for voting in favor of antisocial programs and policies. I would say that at least Democrats SPEAK as though they care about their fellow human beings, but vague concepts like hope and change are no deeds. I give President Obama credit for pulling a "Sully Sullenberger" and getting the nose up on the plane at the last minute when he took the yoke, but in terms of fundamentally changing the nature of the people's relationship to their government for the people's betterment, nothing much was changed. Obamacare fell way short of what is needed, but at least when the GOP tried to take even that meager crumb away from the citizenry, it exposed the politicians as nothing more than corporate tools. ANY politician that can't wholeheartedly and unapologetically get behind, and vote for, policies and programs that promote these simple aims of good government, should be voted out of office at the earliest opportunity. 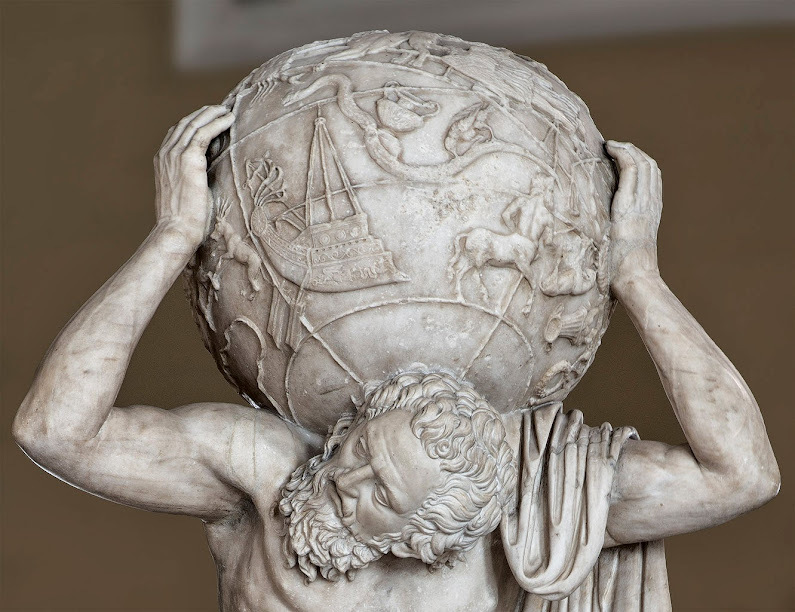 If Atlas isn't going to do his job of supporting the world I say we give him the boot, and take a turn at supporting it as a collective of caring and compassionate citizens. I read an excellent description of our ruling elite in the book Buddhism Without Beliefs by Stephen Batchelor. The gist of the idea is we are confusing alienated self-centeredness for individual liberty. When you examine the choices our representatives make in how to allocate money and whose rights to protect, you can see they have a great deal of fear for anything alien to their narrow, self-interested, worldview. They spend a grotesque amount of the budget on the military, law enforcement, the penal system and surveillance to ensure threats are discovered and met early (maybe when they're still only thoughts in someone's head) and controlled with violence. In short, we have people making decisions for ALL of us who see themselves at war with the potential threats outside their skins, and are motivated by greed that even a billion dollars wouldn't quench. The most amazing thing of all is, rather than being publicly executed for crimes against humanity, they find a way to be extremely well paid to make the worst possible decisions and maybe even end the lives of everyone on Earth. I suppose assassins are well paid for a similar reason - most people wouldn't violate their moral code against harming, even killing, people for money. No, we don't need to "have a frank discussion" or "adhere to our core values" or "do a better job communicating our message." We need to put up FDR's Second Bill of Rights as the standard by which policies and laws are judged, and EVERY elected official that wavers the slightest bit from that spirit needs to be voted out instantly. If a guy like Grover Nordquist, who fantasized about making government so small it could be drowned in a bathtub (how psychotic is that mental picture? ), can threaten almost the entire congress to take a pledge not to raise taxes, surely 100 million of us can make an even more ominous threat. We tried Occupy Wall Street and they just looked down from the high rises and thought, "Look, the peasants are revolting. Damn hippies." No longer can the self-appointed "Masters of the Universe" get indignant if boycotts, vandalism and sabotage are directed at them because they ignored the voices of peaceful protestors. Let us rise up and take back government of the people, by the people and for the people and help the "captains of industry" onto their jets and off to whatever secret billionaire enclave they may have. We're trying to have a society here.